Bela Lugosi served as a live-action model for Chernabog, the demon in "Night on Bald Mountain." Lugosi spent several days at the Disney studios, where he was filmed doing evil, demon-like poses for the animators to use as a reference. However, Bill Tytla, the animator in charge of Chernobog, was dissatisfied with Lugosi's performance, and had sequence director Wilfred Jackson pose for the cameras. Thus it was Jackson, not Lugosi, who appeared on-screen as Chernobog. Walt Disney himself related the story of a chance meeting with Leopold Stokowski at Chasen's. They agreed to have dinner together. As they talked, Disney told of his plans to do "The Sorcerer's Apprentice" and other possible projects using classical music with animation. Disney said that he was stunned when Stokowski, then one of the two most famous conductors in the country (the other being Arturo Toscanini), responded by saying, "I would like to conduct that for you." It was an offer he couldn't pass up. Walt Disney originally wanted to re-release the film each year with new music segments, but this proved over-ambitious. Among the pieces that were at least storyboarded for insertion were Jean Sibelius's "Swan of Tuonela," Richard Wagner's "Ride of the Valkyries," Nikolai Rimsky-Korsakov's "Flight of the Bumblebee," and Carl Maria von Weber's "Invitation to the Waltz" (a new concept that would have starred Peter Pegasus from the "Pastoral" segment). Some of these ideas, however, were incorporated into Fantasia/2000. Nigel De Brulier was used as the model for the sorcerer. James Wong Howe served as cinematographer for the live-action segments uncredited. Bill Tytla, the artist responsible for creating Chernabog, also created Sugar Bear, who was used to promote Post Cereal's Super Sugar Crisp (later called Super Golden Crisp). A segment featuring Claude Debussy's "Clair de Lune" was animated and intended as part of the original release but cut due to the film's already excessive length. "Clair de Lune" was reworked and rescored as the "Blue Bayou" sequence in Make Mine Music. A restored version of the original "Clair de Lune" sequence, released in the 1990s as a stand-alone short, can be found on the "Fantasia Legacy" supplemental DVD. The framing Leopold Stokowski footage for the segment could not be found, however, so the sequence is framed by recycled footage from the "Tocatta and Fugue" segment. After initially considering and then rejecting the suggestion that Dopey (from Snow White and the Seven Dwarfs) would be the star of what he saw as the ultimate Silly Symphony, Walt Disney decided that his favorite, Mickey Mouse (a character whose future on the silver screen was a prime concern for Walt), should play the key role in an animated special featuring the music "L'Apprenti Sorcie" (The Sorcerer's Apprentice) by French composer Paul Dukas instead. All prints made between 1941 and 1956 were re-mixed in monaural sound. The stereo was not restored until the 1956 re-release. At just over 120 minutes in length this is the longest Disney animated feature. At the beginning of the Chinese Dance segment of "The Nutcracker Suite," Hop Low, the little mushroom, does a little jump while criss-crossing his legs. Animator Art Babbitt got the idea from The Three Stooges - it's one of Curly Howard's signature moves. Before Leopold Stokowski agreed to conduct the music for the film, Arturo Toscanini was considered as conductor. 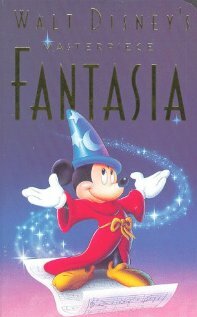 In the 1990s book "Fantasia", John Culhane describes how he was told that members of the Disney staff were busy listening to a 78-RPM album of Toscanini conducting 'The Sorcerer's Apprentice', but quickly hid it when they heard that Stokowski was actually on his way to the studio. Character actress Ruby Dandridge served as the live-action reference model for Hyacinth Hippo in the "Dance of the Hours" sequence. Disney digitally re-recorded the soundtrack for the 1982 re-release because the original Leopold Stokowski soundtrack from 1940 sounded dated and very limited in fidelity. But for the 1990 50th Anniversary release, Disney reverted to the original soundtrack from 1940, which they cleaned up as best as possible (although the limited fidelity could not be corrected) and this is the soundtrack the film has today. During production, the animators were given no instructions for coloring. Walt Disney instructed them to use any colors they wanted, a first. Early on, Walt Disney and Leopold Stokowski considered having fragrances dispersed into the theater at certain points in the movie to heighten the experience. Suggestions included cereus for "Claire de Lune," jasmine for the "Waltz of the Flowers" segment of "The Nutcracker Suite," incense for "Ave Maria," and gunpowder for "The Sorcerer's Apprentice." Disney dropped the idea because of the difficulty of clearing one scent from the theater before spraying in the next one. Early story treatments for the "Rite of Spring" extended the time line to the appearance of humankind and the discovery of fire. It was decided to end the segment with the extinction of the dinosaurs to avoid controversy with fundamentalist groups. For "The Sorcerer's Apprentice", Mickey Mouse was redesigned by Fred Moore to give him a more modern look and eyes with pupils for the first time. By the time the movie was finally released (two years after "The Sorcerer's Apprentice" was supposed to be finished as a stand-alone short), four regular Mickey Mouse films (starting with The Pointer and the promotional short Mickey's Surprise Party) had been completed and released using the new Mickey design. For the ostriches and alligator in the "Dance of the Hours" and the demons in the "Night on Bald Mountain" number, Walt Disney hired the Ballet Russe de Monte Carlo as live-action reference models. Among the dancers who posed for the animators: Léonide Massine, Tamara Toumanova, Alexandra Danilova, Irina Baronova, Frederic Franklin, Nathalie Krassovska, Milada Mladova, Cyd Charisse, and Marc Platt. In "The Nutcracker Suite," considerable live-action footage was shot of Joyce Coles and Marge Champion (who, as Marjorie Belcher, had modeled for Snow White), in long ballet skirts to simulate the movements of the blossoms for "The Dance of the Reed Flutes." For the same segment, Walt insisted that his effects technicians devised a way of transferring Elmer Plummer's (an art teacher at the Chouinard Art Institute) preliminary drawings into animation. After various attempts were rejected, they finally came up with stippled cels, on which the painted characters had a delicate pastel-like look.